Baked in a stone hearth, these pretzels are the freshest we tasted ($2.59 for 8 oz; happyherberts.com). This variety from the top-selling brand in the country is nicely salty ($2.49 for 10 oz; fritolay.com). 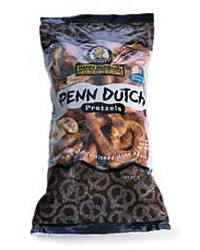 These sea salt-covered, bite-size pretzels have good crunch ($1.69 for 8 oz; wholefoodsmarket.com).